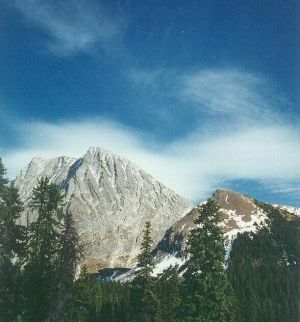 Mount Chester is located southeast of Chester Creek and northwest of Headwall Creek. It is a fairly large mountain which sits on its own above the gorgeous Chester Lake area, and the Headwall Lakes sit below the southeast aspect. The mountain has a popular scramble on its southwest side. Once at the top of the gully, the scramble consists of slabs and scree, and on a typical summer weekend several parties usually ascend this peak. Name Notes: It was named in 1917 after the HMS Chester, which was a cruiser that took part in the Battle of Jutland in World War I.